On Sunday corresponding to 25/2/2007, more than 120 Israeli Military Vehicles raided Nablus City on which curfew was imposed particularly on the Old City and its surrounding neighborhoods. Israeli Occupation Forces (IOF) started a wide and vicious campaign on the City and its belongings; two houses were demolished in the Old City, another was set on fire at Al-Makhfyah Neighborhood, and more than 100 doors of “commercial stores” were destroyed, not to mention the damage brought upon the entrance of every house on the pretext of searching for “wanted people”. In the same context, IOF surrounded the City’s hospitals; searched ambulances, and suppressed the work of the medical teams at the hospitals, which caused a severe and negative impact upon patients and their treatment. The new, yet old scenario of Israeli Forces’ Invasion upon the City has made all Health Institutions work on activating their emergency plans to face this ferocious operation. According to sources from hospitals and field institutions more than 150 persons were arrested, 40 citizens were injured, and a citizen was killed while being on his balcony. IOF actions that resembled in taking over buildings have caused fear and terror among citizens; IOF tend to detain people in their houses i.e. putting more than 20 individuals in one room and prevent them from accessing to their cell phones and even to their refrigerators. We had dozens of calls from imprisoned people, and we barely reached them, many of them were children, women, and some suffering from chronic diseases (hyper blood pressure, diabetes…etc…). Israeli Occupation Forces have inhibited deliberately the work of our medical teams; the Israeli soldiers detained for more than 3 hours 5 of our volunteers; in another area 3 of our volunteers were beaten up by IOF; more than 35 of field workers at the Old City from different institutions were held as well; ambulances were prevented from reaching the Old City or even entering it. In the past two days, our teams at UHCC’s main headquarter and the ones working in the field have received hundreds of calls and appeals from citizens under detention, all asking to be provided with babies’ milk, bread, and medications particularly to those suffering from chronic diseases. We were not able to answer all the calls received due to the Israelis’ arrogance that prohibited us from reaching afflicted families and due to being short in hand, as we did not have enough supplies. In no pre-incident, IOF have intruded the broadcast of local TV and Radio Stations to put on air announcements threatening the citizens from offering help to “wanted people” and asking them to report on such people and in the same time it released a list of names for the “wanted people” on the working local frequencies. 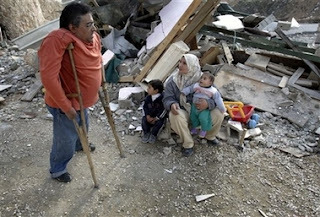 We call upon all Conscience Hearts to help and offer us humanitarian aid from medications and babies’ milk to fulfill our vocational, national, and humanitarian duties towards our people in this Inhuman and Brutal Israeli behaviors brought on the Palestinian Territories in General and Nablus City in Particular, which is under continuous siege for the past 5 years. We call upon all International, Law, and Humanitarian Institutions, International Red Cross, and WHO to condemn and denounce the Israelis’ Oppression that violates and infringes all International Laws and Treaties. We in Union of Health Care Committees (UHCC) call upon you to help & support us in any manner you see convenient; we are now more than any time else in need for your aid & assistance, to be able to serve our people everywhere. Al-Moutanabi St. Fraitkh Bldg. Nablus-Palestine. Tele-Fax: 00972 9 2372432, 2336668. P.O. Box: 796, Nablus-West Bank-Palestinian Authority. 1938. 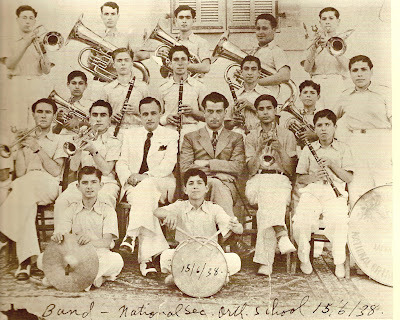 National Christian Orthodox School, Jaffa. Khalidi, Walid. Before Their Diaspora. Washington D.C.: Insitute for Palestine Studies, 1991. One wonders how these Palestinian kids found time for music practice because in a deviation from the norm, unlike other students all over the world, Palestinian students love to read their textbooks. It's rare to come across a Palestinian student engaged in any other pursuit. Palestinian teachers are proud that they don't have to cajole, bribe, or take away recess from these kids, who naturally gravitate toward textbooks, the thicker, the better, according to Palestine's Minister of Education. "Evidently, the fabled Arab mind takes to textbooks," the minister proffers. In their beloved textbooks (just ask Hillary or John McCain) they devour pages and pages of unflattering stories about the Russian, French, Canadian, North American, South American, British, Peruvian, Indian, Polish, and Lithuanian Zionists who made for themselves a miltarist's dream home in Palestine. And these very textbooks, according to wannabe Arabists Hillary and John, are why the Palestinian children don't take to the uzi loving Ethiopeans, Indians, Parisians, and Rio de Janierians in their midst. Much to our senators consternation, Palestinians question the "morality" of the so-called "Jewish" state built upon their ashes. Now, American students might not know why because unlike their over achieving Palestinian counterparts, it is hard to get American kids to read nowadays. But, I bet American kids would be riveted to their textbooks and pay attention during current events if they studied about little Ebtisam Al Tardh, who was scared to literal death by Israel's soldiers. The little five year old went into shock when Israel's stormtroopers busted into her house during the middle of the night, a frequent occurance in occupied Palestine. And American kids might just think twice about the morals and intellect of Hillary Clinton and John McCain who keep harping on textbooks if their current events classes were as exciting as a Palestinian kid's day. Because in Nablus right now, kids aren't in school: kids are being arrested, hospitals are taken over by soldiers, soldiers are shooting at medical teams trying to take the injured from the besieged town to hospital and Anan At Tibi, 42, was killed in his own home by occupying soldiers who also shot his son and hauled him off to an "undisclosed" location. Nablusian kids are already under curfew and are soon to be joined by Palestinian kids from other bantustans due to Purim, the Jewish holiday. They'll be under even more restrictions than usual so as not to interfere with the jolly settlers' festivities. But not too worry. Palestinian kids won't mind a bit as they'll have more time to stay home and read their textbooks, even without Hillary and John's imprimitaur. My grandfather is standing on the left, and the man standing on the right is Yousef Cadoura, who was mayor of Ramallah from 1943-47. They may not return to their homes although international law maintains that everyone has a right to leave his country and return to his country. 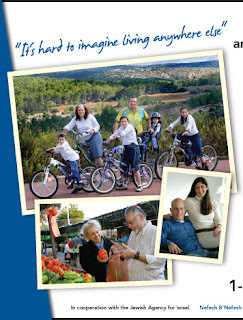 The other picture if from a Nefesh B N'Fesh Advertisement. Nefesh B N'Fesh encourages North American Jews to immigrate to Israel. "They don't want us in this country," says Terry Boullata, headmistress of a private school, and narrator of this powerful film which depicts Israel's institutionalized racism. "They couldn't believe they came to a land with people." The couldn't believe that they came to a land with people so they are erasing the people who have been in the land for thousands of years. "Yitzak Rabin said, 'Yes, they were here,' and they killed him. They really perceive us as inhuman." Terry, a Jerusalemite, will soon need a permit to travel to the West Bank, so that her children may visit their father. "A Palestine Woman" is a powerful film produced by alternate focus which clearly shows how Israel is Judaising Jerusalem, the international city of peace; it clearly depicts Israel's land confiscations and illegal movement of settlers on to stolen Palestinian land; it clearly shows that the wall's purpose is to absorb the settlers, the "masters of the land" into Israel and to put Palestinians in thirty-three isolated cantons; it clearly depicts the inhumanity and criminality which is Zionism. The photo of the young woman holding on to the door appeared in National Geographic's September, 1926 edition. 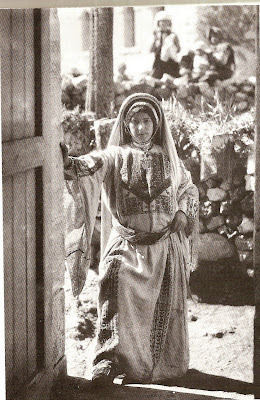 The other young woman from Ramallah's picture appeared in National Geographic in December, 1950. Shaheen, Naseeb. A Pictorial History of Ramallah. Beirut: Arab institute for Research and Publishing, 1992. This film shows the effect of sanctions and checkpoints on the economy. It was made in Balata Refugee Camp. In his introduction to Before Their Diaspora, Walid Khalidi describes Israel's application to "the newly occupied territories  the very policy of systematic colonization, pursued by the Zionists in Palestine from the 1880s until 1948, that created the Palestine problem in the first place." He notes "Between June and September 1967, it expelled across the Jordan River some 250,000 inmates of the refugee camps located on the West Bank and Gaza Strip." He continues, "Israel has facilitated its colonization of these territories through a whole gamut of administrative, legalistic, economic, psychological, and physical measures. Immediately after the cessation of fighting in June 1967, Israel annexed East Jerusalem and declared the 'unified' city its capital. The municipal boundaries were expanded to include large areas of Palestinian territory on the West Bank. Strategic parts of these areas were expropriated and housing projects completed in them to accommodate Jewish settlers 'returning home' from Russia and the United States. Bulldozers were dispatched into the Old City of Jerusalem to tear down venerable medieval Muslim religious buildings adjacent to the Wailing Wall. Dozens of Muslim family properties withing the Old City walls were seized in the name of 'public interest' and transferred to Jewish ownership. Extensive excavations were undertaken next to the foundations of the holiest of Muslim shrines without prior permission of the Muslim religious authorities. Three prosperous villages in the foothills around Latrun were literally erased from the map and their entire population expelled overnight." Khalidi, Walid. Before Their Disapora: A Photographic History of the Palestinians 1876-1948. Washington D.C.: Institute For Palestine Studies, 1991. I am thrilled that you are running for president, and I really do very much hope you get elected. Earlier tonight I saw a bit of an interview with you and your delightful wife, which also showed footage of your very adorable daughters. A fine family indeed and I do hope your run for election is successful. I like that you seem to have a sense of humor- and humbleness. And your name sounds like poetry. I am writing tonight because I am very concerned about the Middle East and the way that politicians play up Israel in order to get elected. Please don't do that. Apartheid should not be praised... and really we should not be making peace with any kind of crime against humanity. Nor should we be aiding and abetting it. I can understand why as a politician you must be careful in what you say, especially about out "friend" racist Israel.... just please don't be bullied into praising it and idolizing it. Please stay true to America- and American ideals. 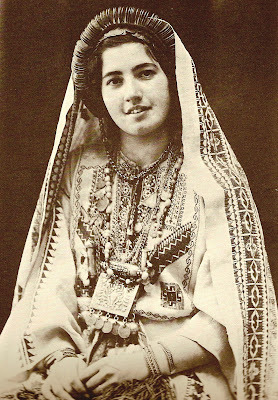 Ruth Raad in the traditional costume of Ramallah, circa 1943. Khalidi, Walid. 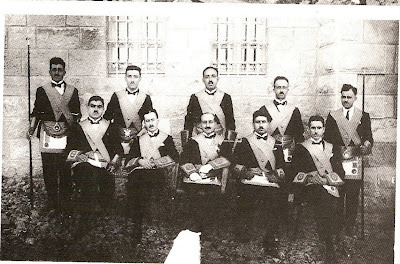 Before Their Diaspora: A Photographic History of the Palestinians 1876-1948. Washington D.C.: Institute for Palestine Studies, 1991. Hillary Clinton Gives Palestine's Texts an "F"
Hillary Clinton in a Palestinian dress with traditional embroidery. Hillary Clinton was on hand for the press conference announcing Itamar Marcus's publication of another of what Palestinian educator Gabriel Baramki calls "poisonous attacks" of Palestinian textbooks. Wonder how many US textbooks Clinton scrutinized before she took on the daunting task of Palestine's Arabic texts? Disheartening to see her align herself with an American-Israeli propagandist who gets paid to cherry pick items from the Palestinian media to aid Israel in its efforts to demonise Palestinians. Marcus is an American and an illegal settler. Did I say that? The ones who hog up all the Palestinian water for themselves. Hillary Clinton is supposed to represent American values. "These textbooks don't give Palestinian children an education, they give them an indoctrination." Unfortunate, that one running for the highest office in the land considers respect for the Universal Declaration of Human Rights "indoctrination." Marcus offers this poem (I am sure his Arabic is impeccable) from a textbook as an example of "the Palestinian demand that Israel accept millions of residents of refugee camps as part of a settlement is one of the chief obstacles to peace." The house calls for the one who built it. Hillary Clinton and Itamar Marcus, ensconced in some neurotic denial that the Palestinians were not ethnically cleansed, expect Palestinian educators to join them in their neuroses, and twist Palestinians expressions of their right to return home as manifestations of hate and indoctrination. Itamar Marcus's livelihood depends on demonising and misrepresenting Palestinians. Itamar Marcus is a "chief obstacle to peace." And Hillary Clinton disgraces America's values and thumbs her nose at peace by embracing this textbook example of a bigot. Amr Abu Daeb and family. Israelis demolished their house in East Jerusalem two weeks ago. According to Ma'an News: "The director of the cartographic department in the society for Arab Studies, Khalil Toufakji, has warned of an ethnic cleansing operation against some 24,000 Palestinians in the old city of Jerusalem." "Rubble from village houses" in Al-Mansura. Al-Mansura was ethnically cleansed in mid-November, 1948 when "Israel decided to empty the Israeli side of the Israeli-Lebanese border of its Arab villages." According to Walid Khalidi in All That Remains, "The people of al-Mansura were ordered to leave; some crossed into Lebanon but most were taken in trucks to the village of al-Rama, to the south." The villagers have sought to return home to Al-Mansura for many years, but to no avail, as Israel, in violation of UN Resolution 194 and Article 13, Section 2, of the Universal Declaration of Human Rights, refuses their inalienable right to return home because they are not Jewish. The Zionists have razed all the houses in the village. In 1944/45, 26,619 dunums of land were owned by Arabs. Jews owned nothing. "The only village structure that still stands is the church of Mari Yohanna." Khalidi, Walid. 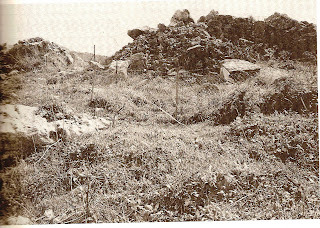 All That Remains: The Palestinan Villages Occupied and Depopulated by Israel in 1948. Institute for Palestine Studies: Washington, D.C., 1991. Khalidi's Dedication: "To all those for whom these villages were home and to their descendents." 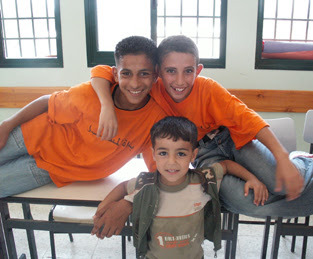 Before coming to Guilford, Omar participated as a youth forum leader in Ruwwad (children of Ruwwad pictured), which means "pioneers" in Arabic. Ruwwad is a USAID funded youth empowerment program. He was involved in its planning stages. However, when Hamas was elected, funds were cut off. he attend the Model United Nations in Amman, Jordan. In a conference of 300 students, Osama and his classmate were the only Palestinians. Osama represented Australia; the school deemed their participation successful, and students from the Friends School in Ramallah will travel twice a year to Amman or Cairo for the Model United Nations, thanks to Osama's pioneering effort. What happened to the three international students at Guilford College is not like any international exchange I've experienced. In high school foreign students with American Field Service were treated with hospitality and were considered special. My year as an international student in Germany was only marred when I took a vacation to Ramallah and had to suffer the indignity of stripping in the Lod airport and on the return trip the insolence of the Israeli at the check-in counter who got some thrill in breaking every one of the malmoul my Aunt had made for my dorm mates in Germany. One Greensboro blogger, oblivious or with an agenda of her own, criticised Omar for mentioning Israeli soldiers in his comments (above), for bringing Israel into this. As if the Zionists' decades long vilification and dehumanisation of Palestinians has nothing to do with a worldview that tolerates ethnic slurs directed at Arabs. Bryan resident Peter Deng, a sophomore, said that the aggressors called the Palestinian students "dirty terrorists" and "sand n***ers." What is most ironic is that my brother was attacked on racial and ethnic motives, while I was in Indonesia participating in a conference held by UNESCO on the "significance of media and communication for cultural dialogue and peace," and while my father was in Paris working on how to foster a universal Holistic approach to education for the wellbeing of children.